Ancol Ergo Large Dog Nail Scissor Clippers are scissor action trimmers for your dogs nails. Fitted with a comfortable, anti-slip handle and a cutting guard to ensure that you do not cut too much nail, the Ergo Large Clippers are safe, accurate and easy to use. I got these today and used them right away. I have a Rhodesian Ridgeback and his claws have always been pretty tough to clip. I found these with the longer handle easier to use. The guard to stop you cutting too much is also good. These were a great buy and were half the price of the ones you can find in pet shop chains that had stubbier handles. I am well impressed as they have saved me the cost of getting his claws clipped at the vets. 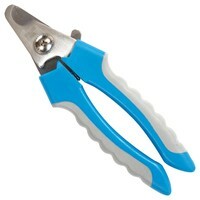 These clippers have a nice sharp blade, making cutting nails quick and easy. The instructions are clear and, as long as you don't have a wriggly dog, or if you have a helping hand, clipping the dog's nails is simple and fast. The 'guard' on the blade is a little awkward and I would be uneasy leaving the clippers in inexperienced hands however, if you know what you're doing it's fine.